If you’re grounded in the basics of security, however, you won’t necessarily want a complete treatise on the subject each time you pick up a book. Sometimes you want to get straight to the point. That’s exactly what the new Linux Security Cookbook does. Rather than provide a total security solution for Linux computers, the authors present a series of easy-to-follow recipes–short, focused pieces of code that administrators can use to improve security and perform common tasks securely. 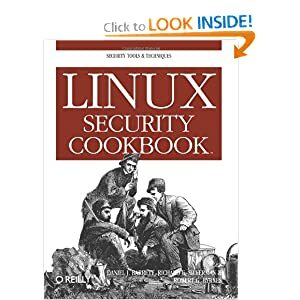 The Linux Security Cookbook includes real solutions to a wide range of targeted problems, such as sending encrypted email within Emacs, restricting access to network services at particular times of day, firewalling a webserver, preventing IP spoofing, setting up key-based SSH authentication, and much more. With over 150 ready-to-use scripts and configuration files, this unique book helps administrators secure their systems without having to look up specific syntax. The book begins with recipes devised to establish a secure system, then moves on to secure day-to-day practices, and concludes with techniques to help your system stay secure. Dan Barrett has been immersed in Internet technology since 1985. Currently working as a software engineer, Dan has also been a heavy metal singer, Unix system administrator, university lecturer, web designer, and humorist. He has written several O’Reilly books, as well as monthly columns for Compute! and Keyboard Magazine. Dan and his family reside in Boston. Richard E. Silverman has a B.A. in computer science and an M.A. in pure mathematics. Richard has worked in the fields of networking, formal methods in software development, public-key infrastructure, routing security, and Unix systems administration. He is the co-author of SSH, The Secure Shell: The Definitive Guide. Previous post: How To Find Out My NIC Speed ? Next post: How Do I Find Hidden Processes and Ports ?